HumanLifeMatters: Show your support for Baby Isaiah and his parents! Show your support for Baby Isaiah and his parents! 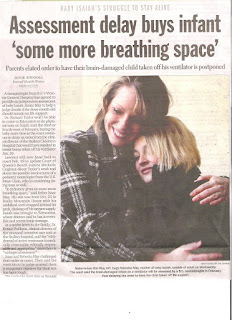 "Baby Isaiah stays on life support for now", Edmonton Journal, 27 January 2010. 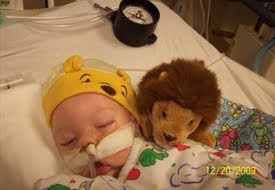 As you read in my last blog (see below), Canadian parents Isaac and Rebecka May of Rocky Mountain House, Alberta, are in the throes of a life and death battle for their three month old baby Isaiah James. He was born oxygen deprived and is ventilator dependent. Doctors at the Stollery Children's Hospital in the provincial Capital city of Edmonton want to turn off Baby Isaiah's respirator which will result in his death. Rebecka and Isaac want 90 days more to see what progress Isaiah will make. Let's be clear, they are willing to accept the terrible prospect no parent wants to face. They simply want to exhaust all possibilities their baby might be able to live. And so they went to court to get an injunction to allow Baby Isaiah 90 more days. That's not asking too much; if they must live for the rest of their lives having lost Baby Isaiah, let them have the consolation that every avenue and chance -- however remote -- was given to their little one. Yesterday, Court of Queen's Bench judge Michelle Chrighton asked for more expert medical opinions about Baby Isaiah's case and gave the May's lawyer until February 19th to find a pediatric neurologist to lend an opinion about Isaiah along with an indepenent neonatologist Dr. Richard Taylor. Rebecka and Isaac established a Facebook page for Baby Isaiah called "Prayers for Isaiah". More than 25 thousand people of good will have become members offering their prayers and encouragement to the Mays. I encourage readers of this blog to do the same (and invite their friends to send notes of encouragement). Offer moral support to this courage young couple fighting for their baby Isaiah James May. Let's double that number and show the Mays that 50,000 of their closest friends stand in solidarity with them! Regardless of how things turn out, I want people of good will everywhere to send a short note to the Mays and let them know the world stands with them in their struggle. If Isaac and Rebecka must face the death of their baby boy, we stand with them in their grief. If Baby Isaiah is to live, we stand with this family in their joy regardless of any special needs he may have. Where there is life, there is hope. You can also send a short letter or card of support to: Rebecka and Isaac Mays, c/o Ronald McDonald House, 7726-107 Street, Northwest, Edmonton, Alberta, Canada T6E 4K3. Alert all your friends, and thank you.